PW-4x4Q is the most powerful and functional super power wheelchair. It's 4X4 system is so powerful that can even climb the stairs and run on very rough or uneven surfaces. It is equipped with Synchro Moving Gradienter patented technology, which is also used by the military. The Synchro Moving Gradienter under the seat will adjust the user's body barycenter to the level of the ground according to different outdoor terrains (such as sandy beach, muddy road, curb, stairs or uneven field). PW-4x4Q a wheel-chair to climb the ladder and actually four-wheel drive. The wheelchair is able to handle a difficult road, including up and down stairs, derivative sharp, snow, mud or sand beaches damaged roads, etc. 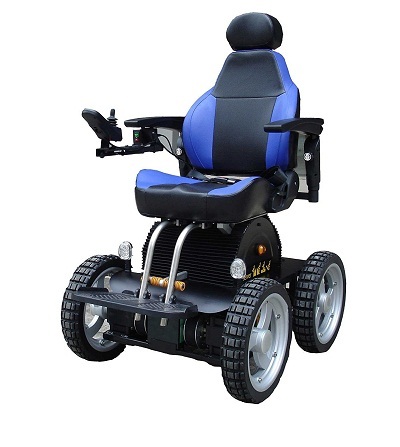 The wheelchair is equipped with a gyroscope to adjust to the angle of seating with earth (ground), angle of the seat will automatically adjust to the stairs or derivatives, thus allowing your body to remain in an upright position. Capable of going up and down the stairs at an angle of 25 degrees, or rung to a height of 12-15cm, depending on the level of user proficiency, with a maximum slope of 30 degrees. The only electric wheelchair capable of making a 360-degree rotation to reverse direction (U-turn) in place, with a radius of only 49 cm round. PG drive controller is equipped with a gorgeous, high precision and LED display. Being able to travel a distance of 20km, including inclines and uneven streets; or 30km on flat surfaces or roads. Seating is higher for better social interaction. A sitting area with a race car design with a solid foam. With the LED lights on the back and sides make the PW-4x4Q readily apparent when used on the road. Sit your hands comfortably and can be removed as well as the height, width, and angle can be adjusted. NEW FEATURE! Adjust the angle of the seat in a reclining position with a stick controller. Click the button below to add the 4 Wheel Stairs Climbing Wheelchair to your wish list.